name can also be a compound name. Cache (the herd name) means that both mother mares were owned or leased by the same individual/farm at the time they were bred for these foals. The sires name is the second portion of the horses full registered name. 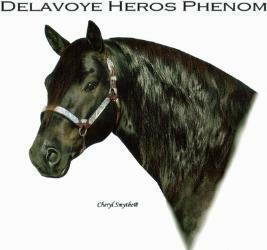 For example: Cache Dawn Taxes and Cache Dawn Tammar were both sired by the same stallion Cartrs Blackjack Dawn. The horses given name forms the last part of its full registered name. For example: Cache Jetson Sable where Sable is the given name. 'D' for 2016 and the letter 'E' for 2017.
existing alphabetical letters when tattooing a horse. Tattooing is no longer used and has been replaced with microchip technology. Once the year letter comes around again and an owner wishes to register a stallion with a given name that has already been used, said name must be followed by a 2nd, 3rd, etc. the 30 character limit which includes the alloted number of available characters for the new given name of a foal. skin, weight, action, height. Finally the nervous system and general appearance are noted. will be more or less so. The fore-foot comes thirdly. No foot, No horse, says Youatt. Nothing can be truer. We have allotted 10 points for this. 2pts Shape & carriage: - Square, that is rather short and with straight lines everywhere; lean; carried rather high and slanting. Ears.- Not too close, thin, active, rather short. Forehead and Face: - Broad and flat. Eyes.-Wide apart; flush with the head; large; moderately convex; bright; and kind. Eyelids.-Thin, wide apart, clean and mobile. 1pt Nostrils.- Large and wide apart. Lips.-Thin, mobile, covered with delicate skin. 1pt Lower jaw.-Wide apart and rather broad at the angle. Cavity between the jaws.-Wide spread, lean and well-hollowed out. Cheeks.- Well-developed, firm, but not fat. 1pt Throat.-Wide across; throatlatch slightly depressed. 4pts Neck.- Rather straight than arched; broad at lower and thin at upper edge; sides slightly rounded and firmly muscled; gracefully attached to the head and well fastened to the shoulders. 1pt Withers.- Lean, slightly raised and long. 4pts Back.- Strong, broad, straight, short. 4pts Loins.- Broad, short, strong, straight. 1pt Breast.- Broad, so that the horses legs are well apart; covered with well developed and projecting muscles. 7pts Chest.- Broad and deep, ribs long, broad, well apart and well arched. 3pts Belly.- Somewhat large but not pendulous; gradually rounding in with the curve of the ribs and flanks. 5pts Shoulder.- Long, sloping and well muscled. 1pt Arm and elbow.- Long, thick, covered with hard and projecting muscles; Arm moderately inclined. Elbow long, parallel to the axis of the body and at the same time apart from it. 2pts Fore Arm.- Descending as low as possible, broad, thick, perpendicular. 5pts Knee.- Lean, long, broad, thick, clean, perpendicular, not turned either out or in. 3pts Croup.- As long as possible, wide, slightly sloping; the point of hip should project but slightly. 1pt Tail.- Large at the root, thick, attached rather high, with an abundance of fine and rather long hair. wide, the tendon well separated from the bone, large and hard. 5pts Hock.- Clean, lean, wide, thick, parallel to the inclined plane of the body, not turned either in or out. Cannon.- Short, broad, thick, clean, lean, perpendicular. Tendons lean, clean, firm, large and well detached. Fetlock.- Broad, thick, lean, clean, slightly slanting. Pastern.- Broad, thick, average length, moderately slanting; free from long hair. the ground; sole hollow, thick; frog strong and rather hard. 5pts Hind Foot.- Should possess all the qualities indicated for the fore-foot, except that it is more oval in shape and the heels are higher and more spread. 1pt Skin.- Soft, pliant, mellow, loose; hair smooth. Colour.- Any colour is acceptable. 1pt Height.- 14 - 16 hands (reviewed in 1991). 1pt Weight.- 1000 to 1400 lbs. 7pts Action.- Lively, brisk, rather long than high; hock, knee, fetlock and pastern bending easily. 4pts - The animal must be of a docile temperament but full of vigour and spirit without being nervous. 5pts - The animal must be graceful in carriage and demeanor as well as in symmetry of shape. 1665. These horses, the best from the King's stable, were of French Norman, Breton, Arabian, Andalusian and Spanish Barb descent. England and France were at war. The topography of the Appalachian mountains was also a formidable obstacle to outside communication. At that time there were no roads and the only means of long distance travel was by foot or by canoe. lack of cross breeding, and their rapid reproduction created a particular genetic group giving rise to a unique breed: The Canadien Horse. that time, it was natural for the horse, being originally from France and having started its spread through the French colonial area of the St.
Lawrence Valley, to be named 'Canadien'. Government recognized the Canadian horse as part of its heritage. Later the Federal Government followed suit giving it national recognition. canadien, available through the Quebec District SEPCC. horses of any other breed." Traits such as these earned the Canadian their nickname "The Little Iron Horse". 1886. 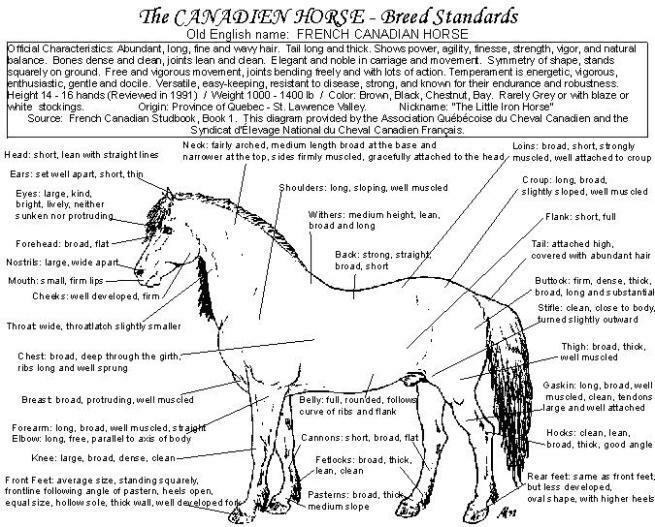 The Canadian Horse Breed Registry is now administered by the Canadian Livestock Records Corporation. 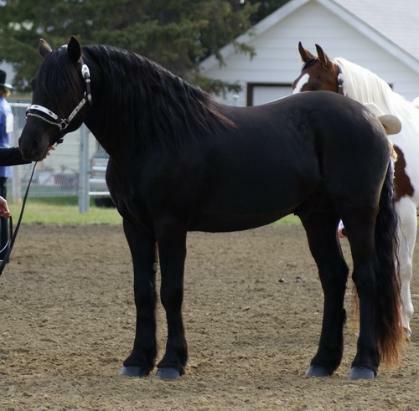 Trotter, Standardbred, and the Saddlebred. Colors: No color restrictions, but mostly black, bay, and chestnut. withers, and a wide chest. The back should be short and straight. Temperament: Friendly, calm and affectionate.